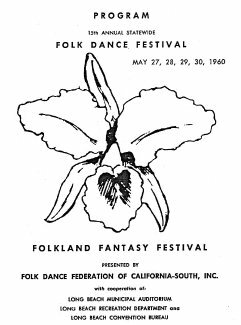 To Long Beach fell the honor of hosting the 15th Annual Statewide Festival, "A Folkland Fantasy Festival." Some new important names come to the surface in this Statewide Program. Names such as Liesl Barnett, Elsie Dunin, Ed Feldman, Bill and Ruth Garber, Ralph and Elsa Miller, Dave and Frances Slater, Avis Tarvin, and Elizabeth Ullrich, all from Southern California. This of course is because the South is hosting the Festival. And, for the first time, our two respective presidents are two lovely ladies, Millie von Konsky of the North and Valerie Staigh of the South. About time I would say. Co-Chairpersons, Lilly Lee and Marion Wilson and their Committee, had a real ambitious program planned for us over Memorial Day, Monday, May 27, through Friday, May 30. Some of us from the North missed the Friday night Opening Party, "Come as You Arrive." At the headquarters hotel, the Lafayette, in addition to space alloted us for Registration, Elsa Miller, in Parlor "D" had a wonderful display of Folk Dance Costumes. The Teacher's Institute Saturday afternoon was chaired by John Hancock and the first official dance took place Saturday night in the Auditorium. Wilma Linscott was chairman of the Sunday morning Evaluation Breakfast at the Lafayette, followed by the afternoon Festival in the Auditorium. 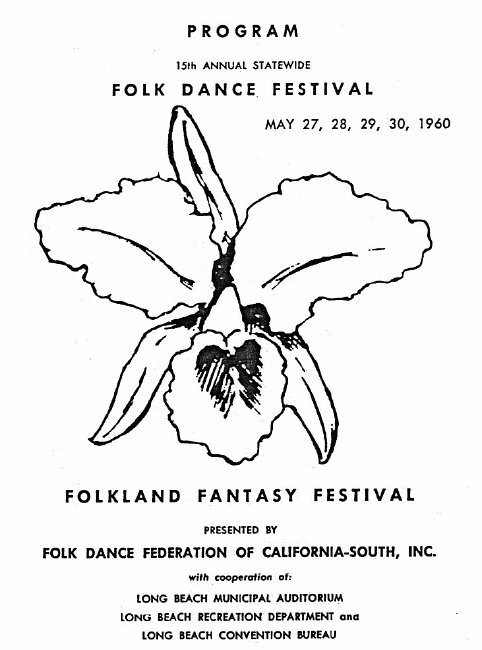 The Sunday evening Festival was also held at Convention Hall in the Auditorium. The After Parties for both Saturday and Sunday nights took place in the Lafayette Starlite Room. By now, one might think everyone was about danced out but for those not on the road home, there was an Afternoon Festival at the Auditorium Monday and that's not all. For the "die hards," and evening party was also scheduled and if that's not enough, it was Party Night Tuesday night hosted by the Silverado Folk Dance Club. By then, most of us were home in our trundle beds, dreaming about how Long Beach knows how to throw a party.